The markets have had a wild week. After more than a year of steadily climbing, stocks spent the past six trading days all over the board. They nosedived, then recovered, then wobbled -- before plummeting again on Thursday. At that point, they entered correction territory as the Dow and the S&P 500 closed down 10% from their recent highs. Both the Dow and the S&P 500 closed above correction level on Friday. But it was another rocky day that left analysts wondering what next week will bring. Here's a day-by-day look at the turbulence that's shaken Wall Street. The Dow closed down 666 points, or 2.5% -- the largest percentage decline since the tumult surrounding Brexit in June 2016. Analysts speculated that the move was in part due to the strong January jobs report, which showed that wages grew at the fastest pace in eight years. That fed concerns about inflation, which could lead the Federal Reserve to raise interest rates faster than previously expected. That came on top a bond market slump, which has also been linked to inflation concerns. The 10-year Treasury yield hit a four-year high of 2.85% last Friday, after starting the year at about 2.4% (prices and yields move in opposite directions). On Monday, things went from bad to worse. Just after 3 p.m., stocks entered a free fall. At one point, the Dow had plummeted a colossal 1,597 points -- the most points it had ever fallen in the middle of a single trading day. By the time the markets closed at 4 p.m., stocks had made a slight recovery. The Dow closed down 1,175 points, or 4.6%. It was the biggest single-day point drop in Dow history. Monday's sharp decline was felt around the world, spreading to Asia and Europe. Major markets in Europe lost about 2%. Stocks in Germany, Sweden and Spain entered a correction. Japan's Nikkei took a 4.7% hit, while Hong Kong's Hang Seng fell 5.1%. In the United States, stocks briefly entered correction territory on Tuesday morning before roaring back into the green. The sharp swing made for the Dow's biggest point gain since August 2015, and its fourth largest ever. The Dow finished the day up 567 points, or 2.3%. In the morning, Trump broke his silence on the stock market turmoil. "In the 'old days,' when good news was reported, the Stock Market would go up," he said on Twitter. He added, "Today, when good news is reported, the Stock Market goes down. Big mistake, and we have so much good (Great) news about the economy!" Markets stayed shaky on Wednesday, but avoided a dramatic rise or fall like on Monday and Tuesday. A 381-point surge in the morning evaporated by the closing bell, when the Dow finished down 19 points. The S&P 500 also closed slightly lower. And then, another huge drop. 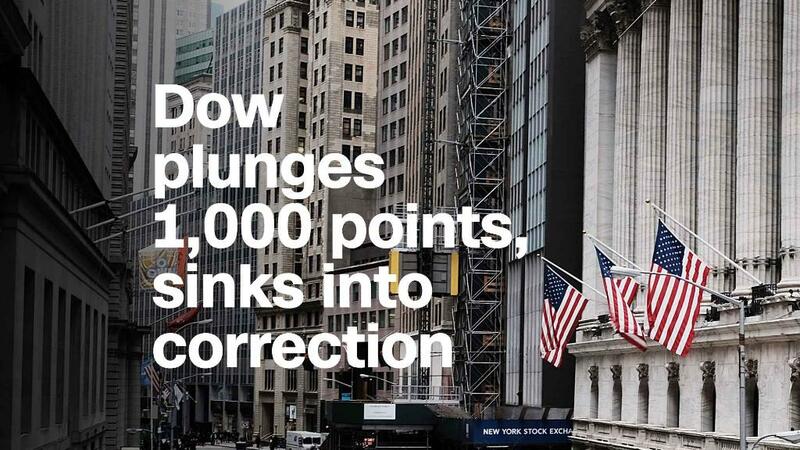 The Dow plunged 1,033 points Thursday, or 4.2%, once again entering a correction. Its record high was just two weeks ago. The fall was the second-worst point drop in history -- behind only Monday. Bonds continued to be a driving concern. The 10-year Treasury yield briefly hit a new four-year high of 2.88%. Wall Street topped off the rollercoaster week with a gain. The Dow closed up 330 points on Friday -- but for much of the day, it was hardly clear in which direction stocks were headed. At one point, the Dow was down 500 points. At another it was up 500. If the Dow had slid at all on Friday, it would have made for its worst week since the 2008 financial crisis. But it's worth noting that things were much worse then. In 2008, the Dow once nosedived nearly 8% on a single day.